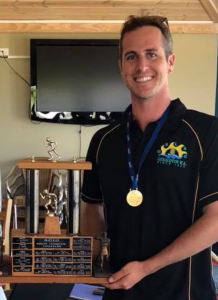 Over the weekend our Graduate Surveyor Callum Ilich (and Director of Lifesaving and Coaching of the Geraldton Surf Lifesaving Club) competed in the Open Men’s State Champion Lifesaver. The event tests all disciplines of surf lifesaving. It is a points based event involving a swim race, board race, tube rescue race, and a beach sprint. There is also a 40 question theory paper based on the surf lifesaving manual. And you must demonstrate, and be graded on, your resuscitation skills. This is Callum’s third year in the open Men’s division and the first time he has won gold. Out of a potential 120 points Callum scored 108. Callum will represent Western Australia at the National Champion Lifesaver event on the 16th of April in Perth. For more information on the Geraldton Surf Life Saving Club visit thier facebook page.